While the NFL trade deadline is still a few weeks away, that didn’t keep us from musing about some trades that we would like to see for each team last week. Feasibility is always an issue when discussing swapping resources this time of year, but with news from Arizona that former first-round picks Deone Bucannon and Haason Reddick are available, there is a first-place team that might have the requisite motivation to allow the Cardinals to move on from these players. The Kansas City Chiefs’ defense has been maligned for the better part of the last two years, and for good reason. Even after a solid performance against Blake Bortles and the Jacksonville Jaguars this past Sunday, they are allowing success in the passing game on 53.70% of early downs, which has been the third-worst mark in the AFC. This is despite the fact that outside linebacker Dee Ford is playing the best football of his career (30 total pressures so far), and the trio of Kendall Fuller, Steven Nelson and Orlando Scandrick has A) been healthy all five games and B) played better than expected. Their run defense, allowing the 54.55% early-down success rate (worst in the NFL), hasn’t fared much better, however. This gets to where Bucannon and/or Reddick fit in. The Chiefs signed Anthony Hitchens to a five-year, $45-million deal this offseason to replace Derrick Johnson as their every-down inside linebacker. He has struggled in that role, allowing 33-of-35 targets into his coverage to be completed, for 1.72 yards per coverage snap (fifth-worst among inside linebackers through Sunday). He’s always been a better run defender than a coverage player throughout his career, but he’s just 47th there this season, with 11 total stops and four missed tackles. Reggie Ragland, acquired in a trade from Buffalo last preseason, has been very productive in run defense (14th in run-stop percentage) but has (predictably) struggled in pass coverage himself, allowing 1.66 yards per coverage snap and a touchdown this week against T.J. Yeldon in coverage. 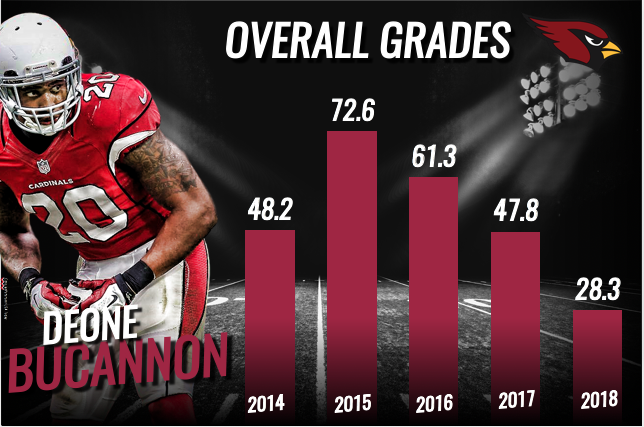 While Bucannon has failed to adapt to Steve Wilks’ new scheme this season, he graded well as a coverage linebacker in 2015 and 2016 and would represent the dime linebacker/safety hybrid the Chiefs have been missing since Tyvon Branch and Hussain Abdullah left after the 2015 season. Whether it has been injuries to safeties Eric Berry and Daniel Sorensen, or feeling the need to play Hitchens and Ragland due to their investment in them, the Chiefs have played six or more defensive backs on fewer than 15% of their defensive snaps this season, down from over 40% the last two years under Bob Sutton. Playing fewer defensive backs has not helped their run defense no matter how you look at it statistically, and while in general more defensive backs does allow more efficiency in the running game, opposing offense’s expected points added against six defensive backs or more when passing the ball is still higher (-0.05 per early-down play since 2013) than when running the ball (-0.07). When it comes to Reddick, it’s important to point out that, in our preparation for the draft, we found that players that play the same position in the NFL than they did in college were easier to predict than those (like Reddick) that changed positions. The Chiefs are currently working with two players in Breeland Speaks and Tanoh Kpassagnon that were interior players at the college level, but are playing outside linebacker in Sutton’s 3-4 defense. The results have been predictable, with the two combining for just 22 pressures and eight stops in 350 career snaps to this point. Even before Justin Houston left Sunday’s game with an injury, the Chiefs have been in search of a healthy and solid third edge player for as long as Sutton has run the defense. Having Reddick (who had 44 pressures and 46 stops as an edge his final season at Temple) in that role could help revive his career and give the Chiefs options in the future – with Ford facing a contract year and Houston carrying roughly $31 million in potential salary savings the next two years. With the highest projected win total in the NFL after five weeks, a bright young quarterback on a rookie deal and a head coaching spinning plates with the best of the NFL’s offensive minds, it will be interesting to see the Chiefs’ appetite for improving the personnel of their defense moving forward. While Bucannon or Reddick will likely not be stars, they could contribute in small ways towards making the Chiefs a top-20 defense, which would likely be enough in an offensive-heavy season like this. In trading for Ragland (a former second-round pick) and starting guard Cameron Erving (a former first-round pick) in his tenure, GM Brett Veach has shown that he’s willing to take a chance on another team’s failed investments. In jettisoning Johnson, star cornerback Marcus Peters and the final three picks of the John Dorsey era after just one year, he’s also shown the ability to cut bait on projects that have produced little fruit. This appears to be an opportunity to do both.